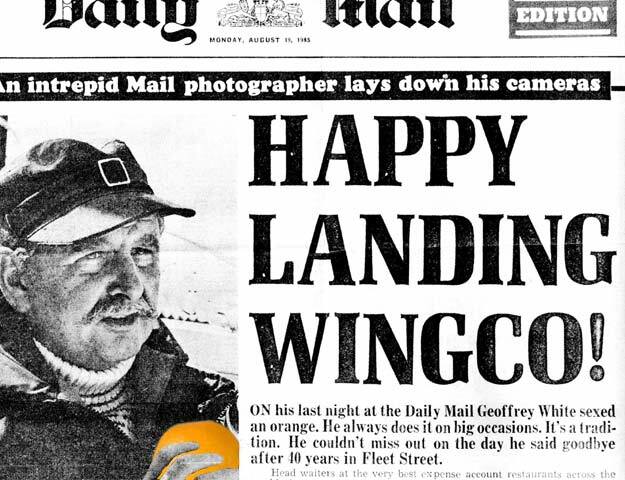 Veteran member Geoff White astounded the assembled company at the 2007 Handlebar Club Christmas Lunch by sexing an orange in public. In the Surrey countryside surroundings of the luxurious Woodlands Park Hotel dining rooms, Club Members and Friends were enjoying yet another excellent Christmas Lunch, perfectly arranged by Rosemary and Conway Chiles. At the end of the meal, Geoff took the floor and with the aid of a small sharp knife and a willing piece of fruit, began to perform his traditional party piece. After some minutes of careful knifework and gentle manipulation, the citrus subject was revealed in all its male glory, to the consternation of one lady waitress clearing the tables. In spite of this, a spontaneous round of applause was awarded for Geoff's deft demonstration. Unfortunately, Conway wasn't able to join us on the day due to ill-health, but we wish Rosemary and Conway a peaceful Christmas and a Happy New Year. Alan was a real character in his local area and was known by most as Bulldog, after his driving school The Bulldog School of Motoring, which he ran for 15 years in the Willenhall area. He served his National Service with the RASC during the 1950s, seeing service in Cyprus, and was a member of the 3rd Battalion Staffordshire regiment during the 1980s. He joined the Regimental Association and subsequently became the Regimental Standard Bearer, which he carried at many an old soldiers' funeral. He also rose to be chairman of the Wolverhampton branch of the Staffordshire Regiment Association. He was originally from Acocks Green in Birmingham, and married a local Girl. Later they moved to Willenhall where they raised a family of two sons and later a grandson. Alan was very much a family man, absolutely devoted to his wife of over 48 years. He was very patriotic, loved people and the country's traditions and its achievements. 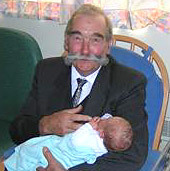 Although only recently joining the Handlebar Club he took a lot of pleasure from his membership. Despite living at quite a distance from the club�s regular meeting place he was an active member, taking part in such fund-raising activities as the 'Taches in a Mini' event. His only gripe was that he wished he "had known of the club's existence 20 years ago!" 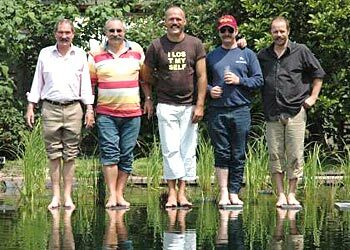 "Members Only - Fixate on your appearance with like-minded others"
A group of gentlemen with hirsute appendages of the upper lip with graspable extremities, that meet for social, competitive and charitable activities. D*b*nh*ms are looking for the most popular group of people in the UK and Ireland. The Handlebar Club could WIN a �5000 shopping spree, club make over and photoshoot. Click on the pink button, then click on the rightmost pink "Rate Us Now" button on the next screen, to register your vote for the Handlebar Club! Members of the 1.Berliner Bart-Club pay a visit to the Handlebar Club at our September first Friday meeting at the Windsor Castle pub. 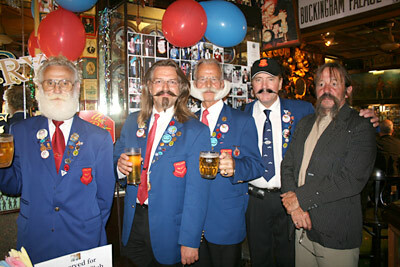 All 5 gentlemen won awards in the 2007 World Beard and Moustache Championships in Brighton. 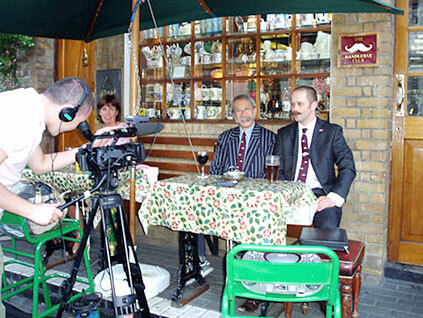 Handlebar Club Tie causes Mt. Etna eruption! 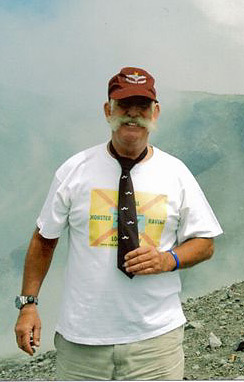 Member Anthony Blyth holds onto his Handlebar Club tie at the summit of Mount Etna, Sicily, on the afternoon of Thursday 16th August 2007, as the erupting gases threaten to whisk(er) it from his grasp. 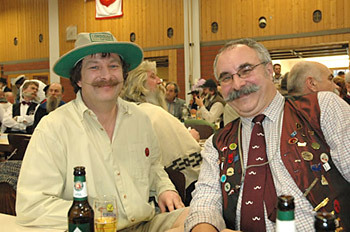 Read Andy Lear's account of The Handlebar Club team's adventures leading up to their participation in the German National Beard Championships 2007 in Schömberg, Stuttgart, Germany. 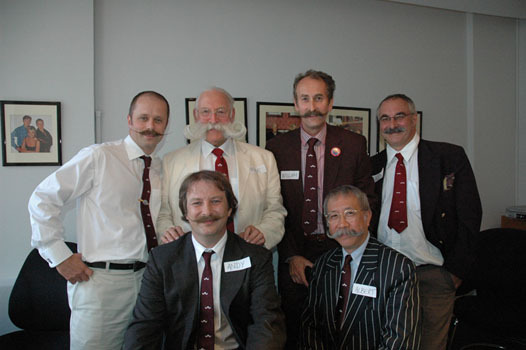 It is my sad duty as Club Secretary to inform you of the passing of Ed Winpenny, a long time member of the Handlebar Club. He died yesterday. Ed's funeral will be taking place at 12 noon on Monday 29th January at Otley Parish Church in West Yorkshire. Please click here for Edward's Eulogy by Mike Solomons. Taches in a Mini - Reloaded! 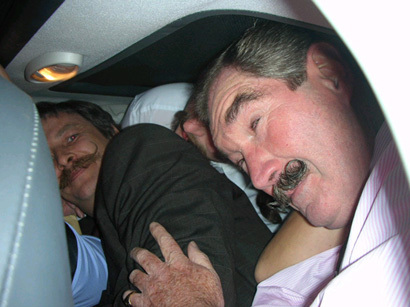 Ever wondered how many Handlebar moustaches you can get in a Mini? Well on Friday 3rd November the Handlebar Club tried to answer that question and make some money for the BBC Children In Need Appeal at the same time. We gathered at our regular watering-hole confident of setting a new record - there being no current record to beat. To cut a long story short we managed nine Handlebars (that being every member of the club at the meeting - there was definitely room for at least two more).Only nine I hear you cry, well ponder this: of those nine only one was under 40, two were septuagenarians, all were either tall or developing a certain middle-aged girth, there was one replacement knee, one pace-maker and all of us had a rather large hirsute appendage of the upper lip. Photos will follow but as you can imagine I was in no position to take any and I'm waiting for some to be sent. The proud Handlebar members have managed to raise a staggering £709.75 and when you take into account of the taxman's contribution through gift aid, the grand total for the charity is: £900.08. Well done fellows! footballer Jason Cundy, Michael Attree tickling Woody from Madness and (far right) The Fast Show's Charlie Higson. On Tuesday 5th September, the Handlebar Club team gathered at the BBC studio at White City to film the 'Eggheads' quiz show. It was truly a memorable experience and every member of the team did have a great time. The programme was shown on Friday 29th September on BBC2 at 6:00pm. Please read the full report of the event. Doug Hardy loved boats especially racing yachts and nearly all of his life was involved with them. In his teens he built and sailed his own racing yacht. Doug worked for a company called Holt Allen, famous for making all types of fittings for racing yachts and although he had ‘retired’ some years ago, he still worked for at least two days a week in his beloved industry. In the words of his lovely wife Evelyn ‘He was a creative workaholic and loved working in the yacht racing world’. His main hobbies were, of course, sailing and racing boats and he did it with love and enthusiasm. When he had a by-pass operation several years ago, he decided that he had to sell his beloved sailing yacht and so he bought a motor boat so that he could still be ‘on’ and ‘use’ the sea. But, he said that it was never the same fun as sailing! Doug joined The Handlebar Club in 1958 and was one of our longest ‘serving’ members and was always delighted to be able to attend the AGM Social Weekends with Evelyn. Doug was also a Freemason, and had told me that he was proud to have been made a holder of Provincial Grand Rank and was involved in the charitable work on which Freemasonry is founded. Everyone who knew Doug, whether they be family, friends or work colleagues said he was a really ‘lovely man’. He was a very active 75 years old and we all thought that he had many years of ‘go’ ahead of him. Sadly, Doug died suddenly on Friday 22nd September. He leaves his wife Evelyn, a son and a daughter and five grandchildren - to whom we offer our sincere condolences. The Funeral will be on Friday 6th October at 12 pm., at St. Mary’s Church, Burnham-on-Crouch, Essex followed by a finger buffet lunch at the Crouch Yacht Club. Albert & Steve being filmed outside the 'Windsor Castle'. In a quest to find someone “unusual looking” the ‘Sharon Osborne Show’ production team needed to look no further than the Handlebar Club. A couple of late Wednesday evening telephone calls led Albert and Steve to hot-foot it from engagements in opposite corners of London to The Windsor Castle the following evening for a spot of filming. “All we want you to do” said the film crew, “ is listen to four music tracks and review them as honestly as possible”. Lubricated with wine and ale the honesty poured forth. We listened to and duly gave our views on the four tracks ranging from dance to rap via rock and easy listening. Having poured our scorn on the “Dean Martin sound-alike” that sounded like something “my mother would like” our musical experts discovered that this artiste was to be a guest on the show – the cutting room floor again then! The September issue of the Handlebar Club Newsletter is now available in the "Members" section. Please note that there are some Club issues which require your attention and response. 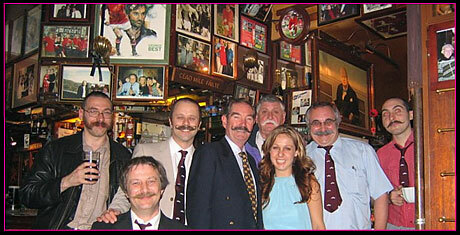 The 'Handlebar' team at the 12-Yard Studio for the audition of 'Eggheads'. Kevin Ashman is the question-setter and arbiter on the Radio 4 quiz show Brain of Britain. In 1995 he won Mastermind, and his first-round score of 41, with 0 passes, remains a record to this day. Judith Keppel was the first person to win a million pounds on who wants to be a millionaire. Daphne Fowler is, apparently, Britain's best known female quiz contestant. She has won numerous game shows on TV and radio, including Brain of Britain, going for gold and Fifteen-to-One, where she scored 432 out of 433. Christopher Hughes was the series champion of Brain of britain and Mastermind and, answering every single question correctly on the weakest link, got voted off in the third round for being a smart arse. Well no cause for alarm there then! I met up with the despicable Parsons in a pub round the corner for a spot of Dutch courage and, although we were still early, when we arrived at the ‘studio’ the rest of the team: Rodders, Mike Solomons, Albert and William had got there ahead of us. There was another ‘try out’ team there as well called 'Civil Disturbance' who were apparently a bunch of civil servants although most of them looked somewhat familiar and we rather suspect that they had a few ringers in there. That was that then, a complete drubbing. However this was just an audition, the winning team might have known more than us but could not muster so much as a goatee amongst them. The staff at 12 yard productions were clearly more interested in us than the actual winners and I have a horrible feeling in my water that we are going to be called for a proper shoot where we will be given the opportunity to look like a bunch of arses on national television. I hope I am wrong but if you can’t trust your own water, then who’s water can you trust? I am sad to announce the death of a 'Friend' of the Handlebar Club, my Godgranny (my God father's mother) Barbara Rickards on Friday 16th June, aged 96. She died peacefully in a nursing home in Herefordshire. Her son, who lives in New Zealand, had spent the last month of her life with his mother. Those who attended the AGM in Tonbridge may remember her. Those who did not know her may realise what sort of character she was when I tell you that at the age of 88 she bought a computer and took lessons and at 90 went hot air ballooning, then had to have a skin transplant on her leg after gashing it getting out of her grandson's powerboat! Carolyn, Geoff and I attended a service recently to celebrate her life - she was not the sort of person who wanted anyone to mourn - a lovely lady who will be sadly missed by anyone who had the fortune to know her.